by Jim Fussell (1)In 1994 genocide in Rwanda began, an ID card with the designation "Tutsi" spelled a death sentence at any roadblock. (2)Along with the prior training of militas, stockpiling of weapons, direction of the mssacres by hate radio, the prior existence of ethnic ID cards was one of the most important factors facilitating the speed and magnitude of the 100 days of mass killing in Rwanda. Most writers on the 1994 Rwandan genocide note the introduction of group classification on ID cards by the Belgian colonial government in 1933, an action most significant because it introduced a rigid racial concept of group identity where it had not previously existed. Of great significance also, however, was the repeated decision by the post-colonial Rwandan authorities to retain the group classifications on ID cards. In massacres northwestern Rwanda in early 1993, ethnic categories on ID cards facilitated the identification of victims. When this event occurred negotiations were in progress for power-sharing under a Transitional Government. Among the provisions in the August 4, 1993 Arusha Accords was the following, " The Broad-Based Transitional Government shall, from the date of its assumption of office, delete from all official documents to be issued any reference to ethnic origin." (5) This continued presence of group classification on ID cards, even after their role in facilitating genocidal massacres in 1993, shows that both moderates and future killers recognized in advance the important function these cards might play in ethnically targeted mass killing, such as later ensued in April 1994. The Rwandan genocide was systematic and organized and not a indiscriminate or wanton slaughter as it was sometimes later portrayed. The killing process was sometimed even segmented into multiple distinct steps, with persons involved as administrative accomplices as well as direct killers. The testimony of one witness concerning the actions of Captain Ildéphonse Nizeyimana, a man who is a fugitive at large, underscores the bureaucratic nature of the task. In addition to facilitating the identification of Tutsi victims, another role of ID cards in the genocide was that of psychologically distancing the killers from their victims and from the nature of their task as killers. Rwanda - - - Name and Document form: Indangamuntu, Carte d'identité, National ID card; Year established: 1933, continued in 1964; Status: discontinued in 1996. 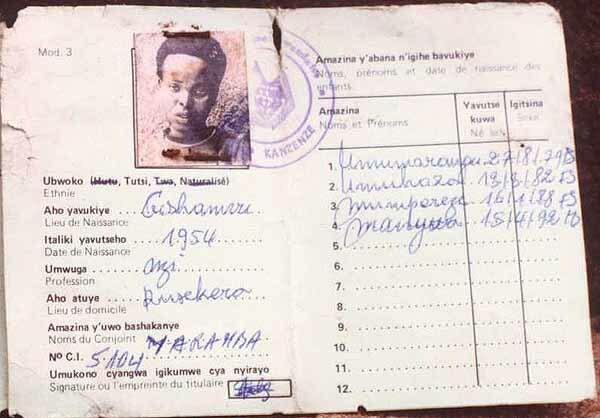 Categories and groups : "Ethnicity" ("Ubwoko" in Kinyarwanda and "Ethnie" in French) appeared immediately beneath the cardbearer's photograph as the uppermost item on page two of the Rwandan ID card. Four possible "ethnic" categories appeared with the issuing official striking a line through all but the applicable category, for example "Ubwoko (Hutu , Tutsi, Twa, Naturalisé)" . The term "Naturalisé" applied to naturalized citizens. Because the cardbearer's name appeared on page one, the name could not be seen together with the photograph and ethnicity, except by turning back to the first page. Below the ethnicity entry pages 2 and 3 of the card included entries for place of birth, date of birth, profession, place of issue, name of spouse, signature of the issuing official and the names and birth dates of up to 12 children. The ethnicity item on the ID card first appeared on ID cards issued by Belgian colonial authorities after 1933. The entry for ethnicity on ID cards was retained after Independence in 1962. Before April 1994, about 85% of the population were Hutu, 14% Tutsi, and less than 1% Batwa (Twa). Scholars suggest that prior to the rigid Belgian classification system imposed after 1926 on Rwandans through ID cards, the census and in employment and education quotas, the Hutu and Tutsi could better have best been described as social caste groups and not separate ethnic groups. Hutus and Tutsis in Rwanda share a common language and religious affiliations. Physical differences sometimes exist, but not always. Intermarriage between the groups has always occurred with some frequency. After the genocide, new cards were issued without the ethnic entry (new residency cards in 1995 and new National ID cards in 1996). Comments: Nearly three years before April 1994, in July 1991, NGOs strongly urged removal of ethnicity from official ID cards. Article 16 of the August 1993 Arusha Accords also required this action by the projected transitional government. ID cards were used to identify Tutsi victims for death during the 1994 genocide. 2) Prosecutor vs. Jean-Paul Akayesu, (Case No. ICTR-96-4-T), Judgement, 2 September 1998, paragraph 123; Alison Des Forges, Leave None to Tell the Story (Human Rights Watch, 1999) , p. 92, note 60. 3) The full paragraph from the Hutu Manifesto reads: "Les gens ne sont d'ailleurs pas sans s'être rendu compte de l'appui de l'administration indirecte au monopole tutsi. Aussi pour mieux surveiller ce monopole de race, nous nous opposons énergiquement, du moins pour le moment, à la suppression dans les pièces d'identité officielles ou privées des mentions "muhutu", "mututsi", "mutwa". Leur suppression risque encore davantage la sélection en le voilant et en empêchant la loi statistique de pouvoir établir la vérité des faits. Personne n'a dit d'ailleurs que c'est le nom qui ennuie le Muhutu; ce sont les privilèges d'un monopole favorisé, lequel risque de réduire la majorité de la population dans une infériorité systématique et une sous-existence imméritée" from "Manifeste des Bahutu: Note sur l'aspect social du problème racial indigène au Ruanda: 24 mars 1957" in C.M. Overdulve, Rwanda: Un peuple avec une histoire, (Paris, l'Harmattan, 1997), p. 98-111. 5) Arusha Accord (Peace Agreement between the Government of the Republic of Rwanda and the Rwandese Patriotic Front), August 1993, Article 16: "Deletion of reference to Ethnic Group in Official Documents:The Broad-Based Transitional Government shall, from the date of its assumption of office, delete from all official documents to be issued any reference to ethnic origin. Documents in use or not yet used shall be replaced by those not bearing any reference to ethnic origin," Arusha Accord (Peace Agreement between the Government of the Republic of Rwanda and the Rwandese Patriotic Front), 4 August 1993. 6)Alison Des Forges, Leave None to Tell the Story, p. 501, citing Human Rights Watch/FIDH interview, Brussels, December 12, 1995; Republique Rwandaise, Parquet de la Republique, P.V. no. 189 and no. 260.